This giveaway has ended. Thank you for participating! Ladies, I am SO excited to share with you a company that I know will bless many of you! I came to hear about Mothering Herbs from a friend's post on Facebook. Mothering Herbs is a mother-daughter team in the business of bringing you the natural products you need. I knew I wanted to try some of the products my friend had shared, and Mothering Herbs has sent me those items to try, just so I can tell YOU about them! First of all, I don't have an infant in my house. So I have been using the Organic Baby Shampoo and Body Wash on my youngest, who is 4 years old. He has a head full of straight, short hair. He also likes to get dirty. I found this wash to be very different than what you'd buy in the store--and that is a GOOD thing! The ones from the store contain so many chemicals and dry out both their skin and hair. This shampoo and body wash contains only organic ingredients, comes out of the container as a foam, and does not make the same skin drying suds as store brands do. I personally would love it if there was a more "baby-like" scent in the shampoo and body wash...BUT since it is organic and safe for my little one, I would rather any smell than chemical smell! It has been a great product to use on my messy little guy--from top to bottom! The next one is the Herbal Healing Balm (Lemongrass). It comes in a BPA-free jar and is perfect for keeping in your purse, diaper bag, or medicine kit. It is for use on small cuts, pregnant bellies, skin conditions like psoriasis, and kids and babies' skin...or as a healing balm for sensitive hands. I know MY hands get dry and cracked in cold temps--and this is what I will be using on them this season!! I also took this product for a test run on an area of my leg that was burned two weeks before this arrived. My dog ran past me while on her tie-out, and the cable rubbed my leg in a straight line and burned the top layer of skin off (maybe two layers). I did not get my essential oils on it soon enough, so it took a while to heal AND left a scar. I have been applying this healing balm twice a day on the scarred area, and it has noticeably diminished! I'm so thrilled! Now....for my favorite product!! The Organic Hand Sanitizer is a MUST-HAVE!! I can't tell what about this product I like best--the sanitizing properties, the smell, or the cool blue glass bottle it comes in! It smells DIVINE, especially at this time of year, with cinnamon, clove, lemon, eucalyptus, and rosemary as its smell-good ingredients! It is so convenient to have a spray bottle for spritzing on hands or surfaces when you need to kill the germs! My children ask for it all the time, and I feel so safe knowing that they can use it. I stopped buying hand sanitizer with alcohol in it because my daughter spent a few hours in the emergency room at age three when she tasted some of the hand sanitizer in our bathroom. It was only a taste, but they did a blood-alcohol test to be sure she did not ingest too much. (Here's hoping that it's the only blood-alcohol test she EVER needs!) Since that night, I have not purchased hand sanitizer, for safety reasons. But Mothering Herbs Organic Hand Sanitizer is a keeper! I will be buying more of this in the future for sure! I do hope you will stop by Mothering Herbs website and take a look around! There are some wonderful gift ideas for new and expectant moms you know....or get something for yourself! You can also find Mothering Herbs on Facebook here! 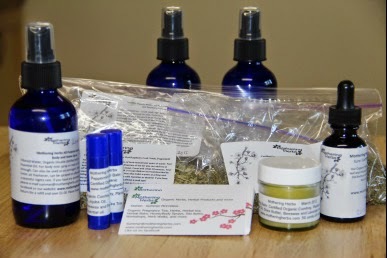 Mothering Herbs has been so wonderful to offer these products for me to try, and they are offering one of you a giveaway! The winner will receive their choice of the Herbal Healing Balm OR the Organic Hand Sanitizer! To enter, leave a comment in the field below! Tell me which of these products you think would be beneficial to you and your family! Then, you can hop over to Mothering Herbs' Facebook page and LIKE their page on Facebook for future information about these wonderful products! UPDATE: Congrats to Laurie for winning the giveaway! Laurie has chosen to try the Organic Hand Sanitizer from Mothering Herbs! You are going to love it, Laurie! I'd like to try the lip balms and the hand sanitizer. A lovely site full of good things. merry Christmas! Herbal healing balm- we just had out 7th trip to the ER this year! I would love to try the Hand Sanitizer. I would like to try the healing balm to use on my kiddos boo boos. I wold LOVE to try that herbal healing balm! The healing balm or organic hand sanitizer would be wonderful to try! Thank you for doing the giveaway! I'd love the healing balm, hand sanitizer, and baby shampoo/wash. Thanks! Merry Christmas! I'd love to try the healing balm! Laurie, you are the winner selected by Random.org! 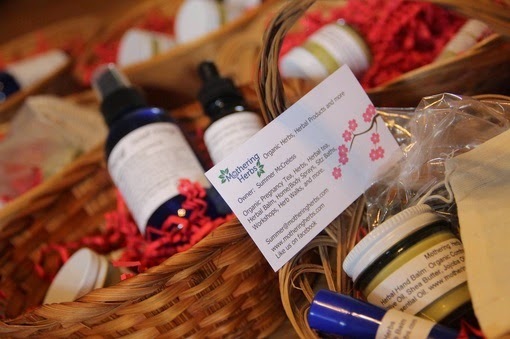 If you will email me at melissa.horton@charter.net, I will get your info to Heather at Mothering Herbs for the hand sanitizer to be sent to you! Congratulations! I'm always looking for a natural shampoo that works!